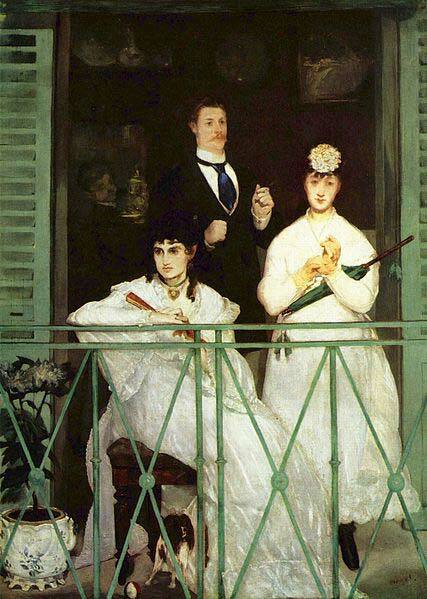 The Balcony is a 67 inch by 49 inch oil painting in the Realist tradition by Edouard Manet. It was painted in 1868 and was shown at the Salon of the Academie des Beaux-Arts the following year. Critics there thought it excessively eccentric and peculiarly colored. It is now displayed in the Musee d’Orsay in Paris. The painting shows three people on a balcony. In the foreground, a woman in a white dress sits on a bench. Her arm rests on the balcony railing. At her feet is a small brown and white dog with a ball. To the left of her is a white flowering plant in a decorative pot. She gazes off into the distance. To the right and slightly behind the seated woman stands another woman in white. She holds a green umbrella with tassels in her arms. She is wearing a hat and she adjusts her tan gloves, as if she is preparing to depart. She gazes out, seemingly at the viewer. To the left of the second woman and slightly behind her is a man in a dark suit with a blue tie. His hands are clenched in front of him as he gazes over the balcony in an unrelated direction to either woman’s gaze. Behind the trio on the balcony, a shadowy room contains a fourth man who looks out at the trio over his shoulder. The scene is framed by the green shutters and railing of the balcony. After Manet met Morisot, the woman painter who is pictured sitting on the bench, she convinced him to try plein air painting. The direct, almost harsh lighting of the painting suggests that it might have been painted at least partially en plein air. The painting was partially inspired by a balcony painting by Goya. Manet often painted scenes that echoed Renaissance works, but his style and techniques were thoroughly modern. This juxtaposition was problematic for early viewers and critics of Manet’s work.